3M(TM) Better Buried Closures are rigid body splice closures designed for direct burial. When filled with 3M(TM) High-Gel Re-enterable Encapsulating Compound 8882, the closure can be re-entered for splice re-work. 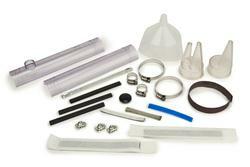 Jaco Aerospace and Industrial is your one stop resource for 3M(TM) Better Buried Closure Partial Kit for Gravity Pour Encapsulation Method and all of your 3M Products, Tapes, aerospace and industrial needs. SKU Marketplace Product Description: 3M(TM) Better Buried Closures are rigid body splice closures designed for direct burial. When filled with 3M(TM) High-Gel Re-enterable Encapsulating Compound 8882, the closure can be re-entered for splice re-work.